GSA is currently accepting proposals from students and postdocs for the next round of Career Development Symposia. Gain leadership experience and serve the early career scientist community! Many postdocs feel powerless. But early career researchers can work together to take control of their future, says Sarah Dykstra, a postdoc at Tufts University and co-organizer of the Boston Symposium on Careers and Collaboration in Science (B-SOCCS). 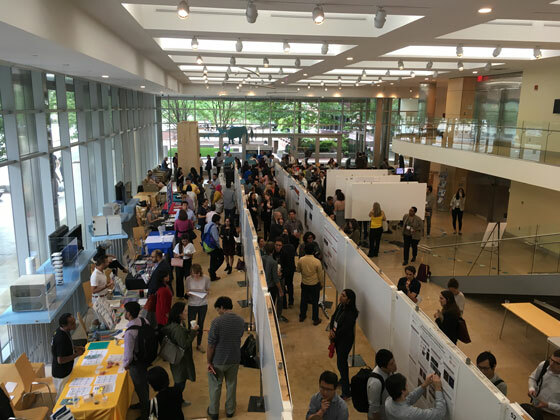 To support this process, the Boston Postdoctoral Association (BPDA) developed a career symposium designed to enhance postdocs’ formal training and to forge new connections between early career scientists. This successful event got its start with funding through GSA’s Career Development Symposia program, but from this early seed the BPDA were able to grow their financial support by ten-fold—and scale up their event to match their big goals. Drug discovery workshop led by NIBR researchers. Pictured is Alokesh Duttaroy. The Boston Postdoctoral Association is a coalition representing postdocs from 17 academic and industry research institutions in the Boston area. It was established in 2013 to support postdoc professional development and advocacy needs. In its first years, the group began by organizing small events and programs. But as they became more established and organized, Dykstra challenged the BPDA to develop a much larger career symposium. They decided such an event could bring their community together to foster collaboration between researchers in both academia and industry. They also wanted to empower postdocs with practical tools for enhancing their professional development. “We were trying to fill the gaps we felt were missing in our own training,” says Dykstra. With this idea, they applied for and received $2000 funding from the GSA, as part of its program to support student and postdoc members organizing career and professional development symposia to early career scientists. Using that vital confidence boost and the help of another early supporter—Angela Florentino, the Broad Institute’s Program Manager for Academic Affairs—they secured space for the meeting and reached out to a wide range of groups for sponsorships and partnerships. They also received early guidance and support from personnel at the Novartis Institutes for Biomedical Research (NIBR), including the head of the NIBR postdoctoral program, Leslie Pond and several senior scientists and program directors. To help share the workload, the event was organized through the teamwork of nearly 60 postdocs. They also tapped into the expertise of their network by seeking advice from successful event organizers and fundraisers. These experiences proved valuable for the organizers’ own career skills and networks. Dykstra is enthusiastic about the boost she gained from being involved, including better project management, more confidence, experience working in large teams, managing direct reports, dealing with people across different sectors, and learning about a wide range of topics that she had never been exposed to before. The end result was a busy 1.5-day event attended by around 350 people, with a mix of workshops, panels, networking events, scientific talks, and posters. 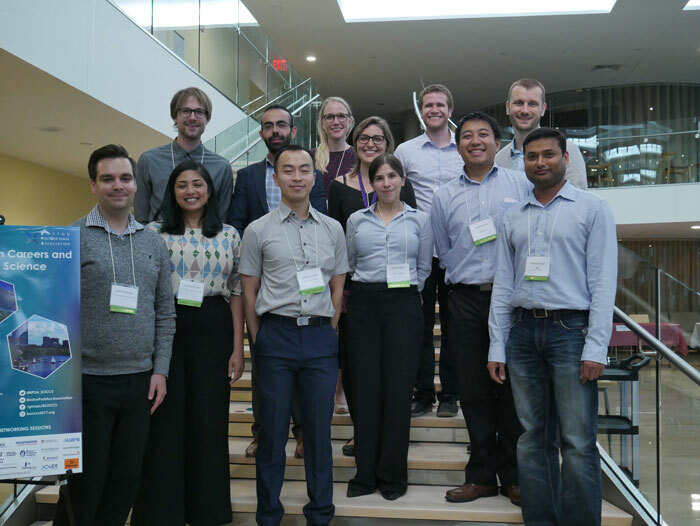 The sessions were designed to draw early career researchers focused on academic careers, those focused on industry, and those who were undecided, bringing them to together to cross-pollinate their ideas. 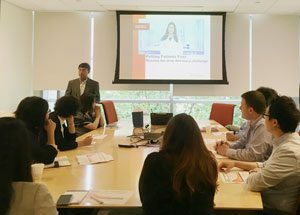 The following day included three concurrent sessions in three general tracks: academic topics like grant writing and academic interviews, industry topics like entrepreneurship and drug discovery, and crossover topics such as communication and leadership. There were also scientific sessions and posters, with prizes. Anchoring all this professional development and networking were two inspiring presentations. Jay Bradner, President of NIBR gave the keynote on the first night. Bradner helped pioneer the open science movement in biology, experimenting with an “open source” approach to the normally secretive world of drug discovery. The plenary talk was given by Phil Sharp, Nobel-winning co-discoverer of RNA splicing, who spoke on the history and future of biotech in the region. She also emphasizes both building on the expertise of others and trusting your instincts. Applications for the next round of GSA’s Career Development Symposia are due January 10, 2017. Read these tips for a successful application first!